What is German cuisine? Is German cuisine even a thing? Or is it just a mere amalgamation of cross-cultural references and above all a bunch of clichés? In yesterday’s article, we learned how to distinguish between Hachse and Eisbein, how the potato became a German kitchen staple, and why Schnitzel is breaded. In today’s article, we delve even deeper into the wonderful world of German food (clichés). If Germans don’t care about a particular matter, they express their opinion, or the lack thereof, with a simple idiom: “Das ist mir Wurscht,” which literally means “This is sausage to me.” An overly sensitive German fellow that is easily offended is called “beleidigte Leberwurst” or “offended liverwurst” in English. As you may have already guessed, sausage holds high significance in Teutonic culture. Accordingly, Germany boasts a quite extensive range of wurst, around 1,500 different kinds to be precise. German butchers distinguish between Rohwürste (raw sausages), Brühwürste (parboiled sausages) and Kochwürste (pre-cooked sausages). Rohwürste contain raw meat, bacon, spices and nitrate. As the name suggests, they are usually eaten raw, but also dried or smoked. Mettwurst is a typical German Rohwurst. It is made from raw minced pork and beef and preserved by curing and smoking. Varieties from the southern parts of Germany are soft and spreadable. Brühwürste, such as Lyoner or Bockwurst are made of finely minced meat. Kochwürste contain, besides the aforementioned ingredients, blood and innards. They are cooked and sometimes smoked. Typical varieties include blood sausage, liverwurst and Teewurst. By far the most famous and popular sausage is Bratwurst. No German barbecue is complete without a bunch of these bad boys on the grill. Don’t have a grill? No problem at all. You can easily prepare your Wurst in a frying pan or cast iron skillet like this one from Le Creuset. While you’re at it, why not pick up some tongs as well!? They definitely make handling sausages and all kinds of meat easier. You are what you eat. 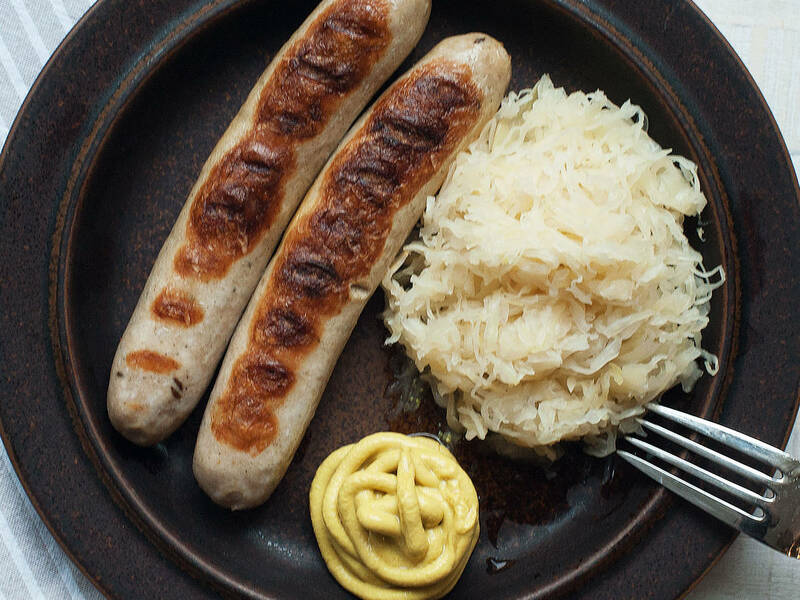 Due to their alleged fondness of sauerkraut, Germans are mostly referred to as Krauts in English-speaking countries. While nowadays the fermented cabbage holds very little significance in the day-to-day diet of the average German, it used to be a German staple up until the mid-20th century. Back then, the availability and variety of produce was more limited, especially in winter. Therefore, sauerkraut was commonly consumed during the cold season as a convenient way to stock up on much needed nutrients. Since it is rich in vitamin C, sauerkraut was a tried and tested method for German sailors to prevent scurvy. Despite the fact that modern food preservation methods and large scale imports of fresh produce have gradually eliminated sauerkraut from the common German’s diet, Sauerkraut is once again on the rise among foodies, thanks to a growing interest in fermentation and its distant Asian cousin Kimchi’s popularity. To make Sauerkraut at home, you will need some pickling jars. Try these by German company Weck. They are easy to use and clean, as well as absolutely gorgeous to look at. You’re going to have to slice up a lot of cabbage. So make sure you have a decent mandoline at hand. This one is made of quality stainless steel and features integrated blades and a safety hand guard. Beer is a vital part of German culture and everyday life, but in a less cartoony, over-the-top Oktoberfest kind of way. Alcohol-related activities that are usually frowned upon in other places, like public consumption or ordering a beer for lunch is a pretty common thing in Germany. Especially in Berlin, a beer is considered more of a summer accessory than an alcoholic beverage. That doesn’t mean Germans are irresponsible drunkards. In fact, accidents due to alcohol are at an all-time low according to the German traffic safety council. However, Germans are not as fond of beer as they used to be. Consumption has been declining for years now. In fact, per capita consumption in the Czech Republic is significantly higher than in Germany. However, with the budding craft beer industry, variety has never been larger than now. India pale ales, stouts and Belgian witbiers have carved themselves a niche among the traditional German styles like weizen, pilsner or Kölsch. To learn more about both German and non-German beers, flip through Jeff Alworth’s Beer Bible. This comprehensive tome provides an overview of the four major beer styles – ales, lagers, and wheat beers, as well as sour and wild ales. This is a great gift for beer beginners and geeks alike. And once you’ve found your favorite beers, invite your friends over for a tasting. But don’t forget about appropriate glassware. The distinct shapes of these glasses by Spiegelau aren’t just gimmicks, but a subtle means to enhance the beers’ flavors and aromas. They’re especially designed to be used for stouts, witbiers and IPAs, but I can’t see why you shouldn’t have a crisp pilsner in them as well.